Sistan Baluchestan is a province in East-Iran that has been and is under systematic underdevelopment, geographic and social intervention that targets ethnic demography, systematic killings and executions by the state, and other complex histories of oppression. We have translated Hamid Mafi’s article that was originally written for our Farsi magazine, because we assume that in many other countries, if not in almost all countries, certain provinces have been neglected systematically and historically. But how is it possible to access what is not even meant to be spoken about? This is one of the biggest challenges that we are facing. In his article, Hamid Mafi looks at these complex layers and tries to disentangle them to enable access to knowledge about Sistan Baluchestan and the way its people are affected by the violence’s inflicted on them. In the last few months, Sistan Baluchestan, a province located in south-eastern Iran, has witnessed the election of an increasing number of women in city councils and overwhelming popularity for President Hassan Rouhani. Hassan Rouhani won the largest share of provincial votes from Sistan Baluchestan, as was also the case for other “reformists” candidates in prior elections. However, the province has also been suspected of involvement in the recent attack against the parliament building and Khomeini’s Shrine just a few days after the elections in June 2017. Government officials claimed the attackers spoke with an accent of the “western and southern” regions of Iran – implying the provinces of Kurdistan and Sistan Baluchestan. Not very long after these two attacks, Iran’s state-run media reported a clash between security forces and a “terrorist team” in Chabahar in Sistan Baluchestan . This news, however, was devoid of any details about the clash apart from reports of the murder of a Ministry of Intelligence officer. One day after the armed clash in Chabahar, Islamic Revolutionary Guard Corps (IRGC) launched air and ground attacks against the Ghasr Ghand region to allegedly “ambush terrorists”. Simultaneous to security force maneuvers in Sistan Baluchestan, yet another “terrorist group” was dismantled in Kurdistan according to the Ministry of Intelligence. He added that in total 180 terrorist groups were identified and eliminated in a short period. These maneuvers together with successive news about terrorist groups emerging from the western and southeast regions of Iran reinforced the brutal suppression of some of Iran’s most underdeveloped and impoverished regions under the pretext of targeting “terrorists”. According to the report published by Management and Planning Organization of Iran, Sistan Baluchestan, Kurdistan and west Azerbaijan are the most deprived provinces of Iran before the Islamic revolution in 1979. Four decades after the revolution, Sistan Baluchestan is still the most deprived region in Iran. Findings also suggest that the province has the highest infant rate mortality and income inequality, the lowest literacy rate, and gross domestic product. It is also last in the social welfare index list among provinces in Iran. The government has utilized “insecurity” as a pretext for the lack of development and services in these regions. As a result, policy makers have escalated the militarization of the region as a path towards development. And with development, the state hopes to reduce conflicts over time. Both development and militarization however fail to address the key question of why these regions suffer from lack of development and deprivation since the formation of “Modern Iran”. To better understand the current situation in Sistan Baluchestan, we need to examine how Iran came to at Kurdistan during the first few years after 1979 revolution. During those early years, the Islamic government proposed three solutions to the Kurdish problem: 1) accepting the autonomy of Kurdistan, 2) then destroying the entire region, and 3) forcing negotiations. This approach was verified by Hashem Sabaghian, Interior Minister of the Interim government about this approach after the 1979 revolution. Hamidreza Jalaeipour, who was governor of Mahabad at the time, wrote an article about the “rise and fall of the Kurdish movement”. In this article, he explained the two viewpoints for solving the Kurdish crisis: the policy of security-suppression and compromise- dialogue. “We must see the presence of IRGC in Kurdistan as the security policy and its success versus the compromise viewpoint due to the failure of the interim government to attract young forces”. He also provided three reasons for the continuity of what he called the “crisis”: Guerrilla organizations constituted of Kurdish political parties, the familiarity of party forces with the region, and a special security policy of the government. Jalaeipour divided the conventional security policy in the Kurdish context posed by different governments after the revolution in two categories. The first was to negotiate with the opposition forces while the military organized attacks in the region. The government then negotiated with various Kurdish officials to not shelter guerrilla forces or would face severe repercussions. He believes that the special security policy of the Islamic republic is the combination of these two strategies. He also added that “the government should manage to service people and ensure their security in the peak of insecurity”. Kurdish forces loyal to the Islamic government were called Jash by the people of the region, and were granted safe conduct in the region by the government. However, it remains unclear how the IRGC organized Jash, how Jash is accountable to the IRGC after a few years, and how this became a model for widespread oppression. This model was specifically employed by Mohammad Boroujerdi, and Mostafa Chamran in Kurdistan, and later expanded to other regions in Iran. Chamran explains the mechanism within which the employment of Kurdish people occurred. Gendarmes located in the border areas employed only Kurds, including Kurdish nomads. This was to ensure that any mercenary combatants would have knowledge about the region. He also narrated that military forces employed 300 people from two tribes. “Of course, in addition to military activities, regional people see how youths, doctors, engineers are dispatched in order to work on construction and development projects”. A little later, Boroujerdi established the Muslim Peshmerga of Kurdistan and played a key role to suppress the Kurds, as they were “familiar with the geography and the language of the regions”. The trend of employing local people turned out to be successful in the latter years of the 1980’s, as many non-locals were replaced by the Kurds who lived in the region. Muslim Peshmerga of Kurdistan were also involved in organizing the Sunni clergy. At that time, the clergy had important roles in rural areas, such that many villagers were armed with the support of the village clergy. The approach developed in Kurdistan remains in existence and has also been spread elsewhere in Iran which have a high proportion of minorities. Muslim Peshmerga of Kurdistan are now officially merged into the IRGC. Today, IRGC together with the army establishes construction sites in the region to not only show its sovereignty, but also emphasize the policy of development and militarization. Security forces also employ over 8000 local people as informers and gunmen. Since 2000, IRGC has assumed responsibility for securing the northwest and southeast borders of Iran. Rouhani’s government also officially delegated the development of border areas to this military organ. In addition to the IRGC, other governmental foundations such as “Jihad of Construction” organization, Astan Quds Razavi, Barekat and Mostazafan operate in Sistan Baluchestan as they did in Kurdistan in the beginning of the Islamic revolution. The arming of local clans was the most successful project conducted by the IRGC. This project was named “shooshtari”, after the commander of the IRGC who was murdered in Sistan Baluchestan. Many Baluch activists, religious figures, and even a few authorities have objected to this project. In 2009, Molavi Abdul Hamid, an Imam of Sistan Baluchestan, criticized governmental institutions for holding “security” related seminars and congresses in Sistan Baluchestan. In summer 2013, Tayeb Mollah Zehi, one of the Sunni clerics said that the distribution of weapons by IRGC to the clans resulted in increased robberies and insecurity, and asked the government to collect the distributed weapons. Last winter, another Sunni cleric, Molavi Sarzehi, also denounced the widespread distribution of weapons in the town of Iranshahr. He declared that “we do not want (military) bases such that disintegrate people and intensify insecurity”. Activities pertaining to the security of the region is not limited to the military operations. Promoting religious and political beliefs of the Revolutionary Guard was also on the agenda. In this regard, 138 Righteous assemblies of Basij were established. 300 thousand people are active in these assemblies. Other activities include identifying those Sunni clerics who did not attend the obligatory military service, and employing them in a so called, “religious kinship.” According to the authorities and analysts close to the government, these projects benefit military institutions within the regime in the following ways: increasing the cooperation of tribal leaders in detaining runaway soldiers, providing immediate support for confronting terrorists, and facilitating the transfer of runaway criminals from Pakistan to Iran. The Islamic Consultative Assembly (i.e., the parliament) in its fourth development plan also proposed employing locals in the security and military apparatus to increase trust with people and enhance “security”. The authors of this plan consider poverty as a key factor driving local residents to joining terrorist groups. Who’s responsible for implementing the state’s policies in Sistan Baluchestan? IRGC has therefore offered those who had been formerly arrested as drug traffickers with weapons. Simultaneously, many jihadi camps were established in poor areas (419 camps up to 2016). These Jihadi camps have attempted to build trust among the people by expanding public services to promote the religious and government policies in the region. In other words, they train “loyalists” in Sistan Baluchestan as they did in Kurdistan with “Jashes”. According to the commander of Kosar, a construction base belonging to IRGC, 1245 “deprivation elimination” projects have been conducted in Sistan Baluchestan. To clarify the factors driving the IRGC interventions in the region, one must consider that 79 percent of Sistan Baluchestan province are originally Baluch and Sunni. Despite these numbers, many Shiite-based projects have been launched in the region. For instance, in the Spring of 2014, 400 Madhab of Ahl al-Bayt of Basij were sent to different areas of Sistan Baluchestan. Moreover, Astan Quds Razavi, a religious and financial institution that is exempt from paying the nation any tax revenues, opened an agency in the province. One of its projects was subsidizing the travel expenses of 2500 low-income people for pilgrimages to Shiite holy sites. Another religious, financial, and military institution that has been based in Sistan Baluchestan is the Barekat institution. Since 2007, Barekat has been active in constructing religious schools, cultural-religious centers, and Islamic seminary schools. These activities have been organized under the rubric of “fighting against deprivation” in the Baluchestan region. Due to Sistan Baluchestan’s strategic location in Iran, military affiliated institutions have invested heavily in the region. In speeches given by Ali Khamenei, the Iranian supreme leader, during recent trips to the Sistan Baluchestan, he emphasized that the government should dedicate a special attention to the Makran coasts. To carry out the order of Ali Khamenei, the sixth development plan includes the establishment of the Makran Coast Development organization. Since then, many military forces and their corresponding business entities have been deployed in the province. As a case in point, the largest military apparel production of the Islamic Republic, Naji Pooshesh company, is now based in Sistan Baluchestan. This company provides 100% of police clothing, 50% of Defense department clothing, and 10% of IRGC’s clothes. Under government support, Naji Pooshesh purchased Tasooki Baft Zabol and Faragir Baft Balooch Iranshahr companies to establish itself as the Iranian military clothing pole. Baluch activists have reported that ownership of certain industries, such as food production (e.g., Protein Arman Jonoob, Sahel Seyd” and Arman Gostar) have been granted to the IRGC. Sixty three thousand hectares of agricultural land has also been allocated to IRGC and the Etka organization, sub-sectors of the Ministry of Defense and the general staff of the armed forces of the Islamic Republic of Iran, to build animal husbandries and industrial complexes. 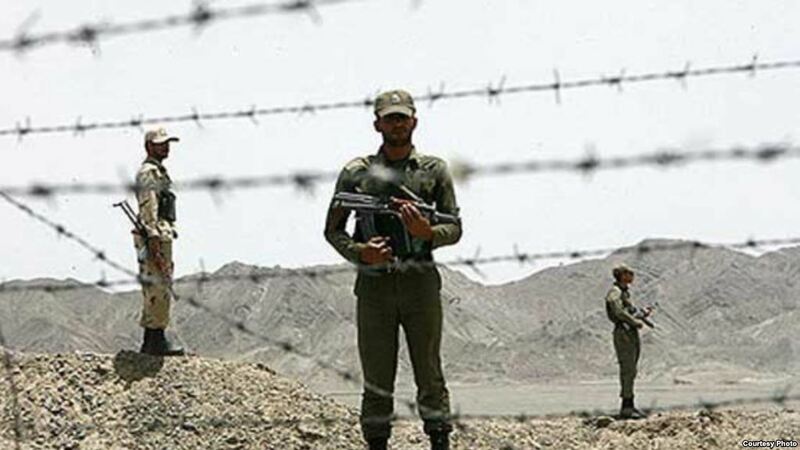 In line with the militarization of the local economy and security plans in Sistan Baluchestan, IRGC gave sections of repossessed lank for free to the “relatives of the state” in order to design an “agriculture-security belt”. For instance, 160 hectares of Sistan Baluchestan land together with 17 water wells were allotted to Habibollah Dahmarde, a former IRGC commander. Economical and security related activities of the IRGC are so extensive that it is almost impossible to enumerate them. Shahram Sekandari, deputy economic director of the Quds corps of IRGC explains: in 2017, 7560 projects have been launched by the IRGC. In addition to these projects, the construction of two product processing factories in the north and south of Sistan Baluchestan and recuperation of farmlands were key priorities of the IRGC since the beginning of this year. He also asked the Rouhani government not to report the IRGC’s activities under the government’s name. However, he intentionally neglected to mention how the Rouhani government and IRGC divided the tasks in the poorer and border regions. This agreement which had already been revealed by the deputy chancellor of the deprived and rural areas makes IRGC responsible for those regions in Sistan Baluchestan. Although it appears that the Islamic Republic may reject Pahlavi era policies, the “development plan” is very similar to prior efforts. Over-reliance on oil revenues, deployment of the assembly industry, promoting consumerism specifically after the Iran-Iraq war, privatization of public services, centralization of development and marginalization of ethnic and religious minorities, repression and terror towards opposition figures, and an attempt to turn Iran into a partner of other economically powerful countries are some of the ongoing policies between the Islamic Republic and Pahlavi regime’s. The Pahlavi’s approach towards minorities, including those in Khuzestan, Azerbaijan, and Kurdistan, was based on blocking developmental processes, the exclusion of the locals from administrative structures and companies, and employing loyal forces in those areas. As a case in point, the population of Khuzestan increased by 25% over a ten-year period. The approach described above was reinforced by the Islamic regime after the revolution specifically among Sunnis and other ethnic minorities. Nowadays, these policies are routinely implemented in Baluchestan. We can see from the immigration figures of the inhabitants of these areas that how the demographic-displacement and population change policies are implemented. According to the provincial governor, Sistan and Baluchestan province has the highest migration of families leaving a region among all the provinces in Iran last year. Halimeh Ali, the former representative of Baluchestan in the Islamic consultative Assembly (i.e., the Iranian parliament) said that 2 to 3 thousand families migrated from Sistan Baluchestan only in the first six months of 2013. While many Baluchis leave their homes to find jobs in other regions of Iran, many others come to Sistan Baluchestan for work. As a case in point, according to the navy commander of the Islamic Republic army, 10 thousand of navy personnel have been deployed in Mokran coasts. A similar deployment has been performed by IRGC to secure the safety of the region. Alongside the deployment of military staff, the large portion of employees in governmental institutions and education are non-locals. Mohammad Naimi Far, the representative of Sistan Baluchestan in the Islamic Consultative Assembly, said that north of the province, where the population is mostly Shiite and Fars, are twice as likely to be employed within the administrative structure, while we have a shortage of workforces in the south, where Baluchis and Sunnis reside. According to him, most teachers working in the south are non-locals or low-ranking soldiers who move to the northern portion of the region when they gain 2 or 3 years of experience. For instance, 80 percent of teachers in Chabahar are composed of non-locals. The consequence of this situation in the southern part of the region has led to lower quality education, and led many students to discontinue their studies and widen the education and human developmental gap between the northern and southern regions. In this approach, Baluchis have lost hope of any future in their regions while forces loyal to the regime find themselves more privileged in the Sistan Baluchestan province. This eventually changes the demographic composition of the region in favor of the government and its loyalists. The minister of roads and urban development in Rouhani’s government believes that the Sistan Baluchestan province has a very high capacity for population growth, and the government is planning to increase investments. Eshagh Jahangiri, Rohani’s vice president, also announced that government development programs include a plan to build new cities in the province. Similar policies have been replicated in Khuzestan towards the Arab minority population who resides there. For the last four decades, the Islamic Republic has utilized its development approach to escalate surveillance and political violence in Kurdistan and other vulnerable regions. Beyond Iran’s borders, the government has also escalated political violence against dissidents, including the targeted killings of Sadegh Sharafkandi and Abdul Rahman Ghassemlou. The killing of Kurdish dissidents in Iraq was also carried to quell “insecurity” and ensure the unhindered “development” of the Kurdish region in Iran, according to Iranian policy makers and planners. The regime’s security apparatus has also increased support for various radical Islamic groups. They have deepened financial and political ties with radical groups to further suppress Kurdish dissidents. While the regime’s assassins have been busy with their activities, proponents of the development approach have attained limited success, such as building military bases for IRGC to facilitate the broader suppression of people in the region. According to the statistics published by the government, the Official unemployment rate is 20 percent. That is why many people choose to become a Kulbar or smuggler in the border regions, despite the government’s heavy military presence along the border. Nowadays, the regime’s gunmen shoot Baluch youth based on the false pretense of of smuggling goods or drugs. Such acts are committed without any trial or details pertaining to such accusations. With time, the “development” approach has actually offered a guise to facilitate the discreet yet escalating violence against locals committed by the regime’s security forces.